I'm standing in the middle of a blueberry patch, the long arms of the bushes reaching out to me, practically begging me to relieve them of their berries. The sun is hot and the air is cool. The boys charge ahead of me, picking and eating and musing about the best way to nudge a blueberry off its stem. I look up at the brilliant blue sky, and I sigh. I catch myself smiling. I realize that I'm happy, right here and right now in this moment. The women the next row over chat about their morning coffee and their cell phone data plans and whether to abandon Netflix. On the other side a family from Florida ponders whether to make muffins or pie first, and wonders whether their friends in Italy eat blueberries, and if they do what beautiful words they shout out when the berries touch their tongues. A few bushes down an elderly man and woman, the sort who look like they hold hands when they're not reaching for berries, slowly and methodically work their way down the hill. They exude the quiet contentment that so many of us spend our lives seeking. What to do with all this happiness, I wonder. This lightness and ease shines so brightly and yet it feels so shy, so ephemeral. I long to clutch at it, to hold it close, but I know that never works. I remind myself to simply enjoy this lovely moment and to savor it fully. I continue massaging the branches and enjoying the plunk-plunk-plunk as the berries fall like raindrops into my bucket. And I try to remember what those wise old Buddhists have to teach us about happiness. They've never failed me in times of difficulty, and they've always offered me comfort and hope. But what do they tell me about happiness? Enjoy it but don't cling, I suppose. Be present for it. Don't over-personalize it, and remember that this feeling, too, will pass. I move on to the next abundant blueberry bush. The words of the poet Naomi Shihab Nye bubble up from the depths of my body. "It is difficult to know what to do with so much happiness," she writes in one of my favorite poems. "With sadness there is something to rub against, a wound to tend with lotion and cloth..."
I pause as I struggle to recall the rest of the poem, where surely she has something to teach me. I recall her words "happiness floats" with a smile, since that is exactly how I feel right now. "It doesn't need you to hold it down. It doesn't need anything." Yes, she's right. I understand. All this happiness wafts through me like fresh air, and for a few moments I almost feel like we're all floating, carried in a little bubble of happiness that slips into the sky like a helium balloon set free. I realize that in the hour we've been picking blueberries I haven't heard a single sour word from anyone. Everyone around me, in fact, seems seized by happiness. My sons have been chattering and plotting and discussing and (sometimes) picking, but miraculously they haven't bickered once. 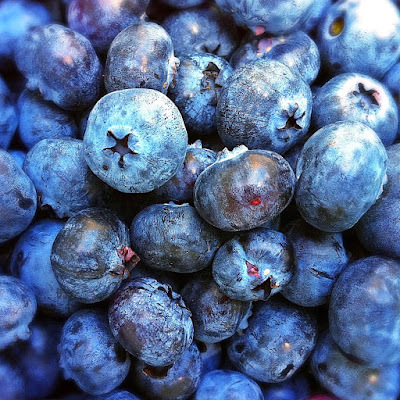 The families around me have been kind and generous to one another, as sweet and as smooth as the blueberries we pick. Is it the weather, perhaps? The brilliant sun that lifts our moods? The gentle focus that's required when picking blueberries? The blueberries themselves? Or could it be the incredible sense of abundance we all feel right now? There are so many berries, in all directions, that no one need fight over a row or a bush or a berry. There's plenty for all and no need for anyone to feel territorial or threatened or greedy. For a few moments I contemplate what the world would feel like if we all lived with our hands held open like this, in total faith of the world's abundant generosity. How beautiful a world that would be. "Happiness floats," indeed. I savor. I enjoy. I ask the boys if they're happy, too, and they are. They say they could stay here and pick all day. "If you're happy and you know it," I call out. And they respond in our family's typical refrain, "Then share it!" Finally, we can carry (and eat) no more, so we head back to the cashier to pay for our bounty. A woman is just heading out into the blueberry patch, with a baby on her chest and four smaller ones clucking about her like noisy chicks. Even she is smiling, I notice. It's just that kind of day. We return home. The boys bring in the berries while I dash upstairs in search of Nye's poem. When I find it, I devour it hungrily, happily, with a sigh. "Since there is no place large enough to contain so much happiness," she writes, "you shrug, you raise your hands, and it flows out of you into everything you touch." I float back downstairs and pull out all the plastic give-away bowls that I can find. I rinse our berries in cool water, and ask the boys to tell me who might need a little happiness today, who might like an offering of fresh berries. We begin naming names and sending out wishes for happiness as we spoon shiny purple berries into bowl after beautiful bowl to share. Because of course, when you find yourself surrounded by a bumper crop of blueberries - or perhaps with an abundance of happiness - the proper thing to do is to welcome it into the marrow of your bones, to savor it deeply, and then to pass it on to others as an offering to the greater world. This article was originally published in Yoga International (Fall 2012). The poem So Much Happiness by Naomi Shihab Nye can be found here.